Last week I was helping a friend finalize a build for their laptop. 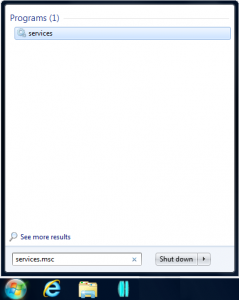 The last thing was to map a network drive to their WebDAV share to be available upon startup. Much to my surprise I kept receiving errors every time I attempted to map the WebDAV. 5a.) 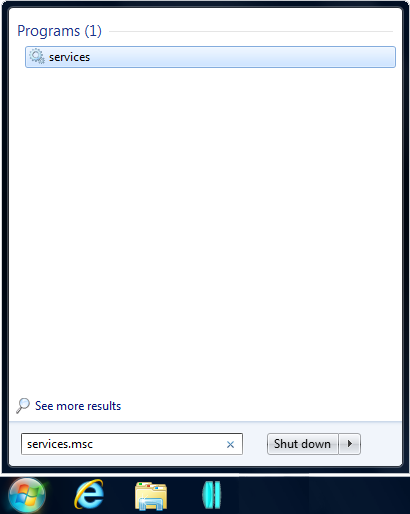 Start > Search > Type: services.msc > Select Services. 6.) 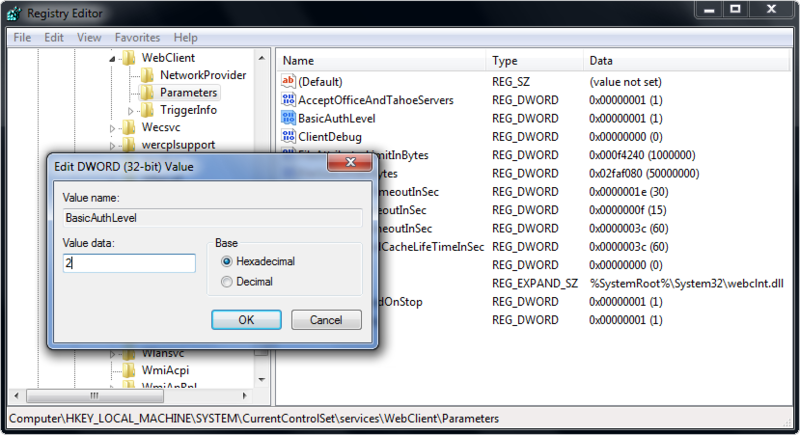 Modify the Windows registry, this will enable Windows to accept basic authentication for SSL and non-SSL shares. 6a.) 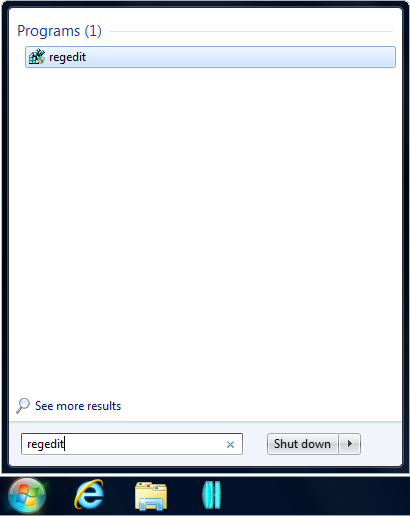 Start > Search > Type: regedit > Select regedit. 8.) Map your WebDAV share as a network drive. 8a.) 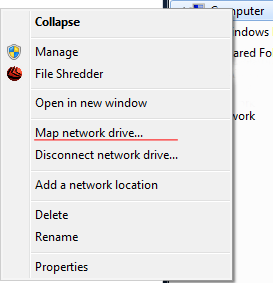 Using Windows Explorer Select My Computer > Select Map Network Drive. 8b.) 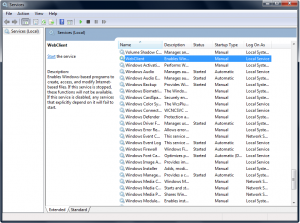 Put your WebDAV URI as the location and complete the desired settings (i.e. reconnect on login and use different credentials). Hopefully the WebDAV share will connect and you can access it as a mapped drive. 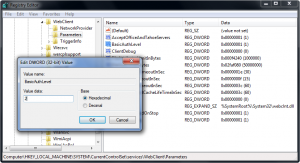 “Howto Fix Webdav On Windows 7 64bit |.” Web. 16 July 2011. “Mapping Network Drive on Windows 7, Vista, Windows XP and Windows Server 2003.” Web. 16 July 2011. 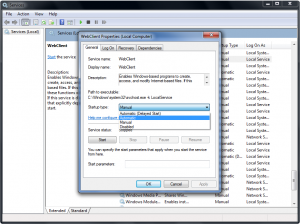 “Web Folders / Web Disk / WebDAV Problems on Windows 7 – TechieChips.” Web. 16 July 2011. Thanks a million. I’ve been looking around trying to get this to work, and up until now have just been using XP virtual mode! What a pain. Thanks again for the great writeup and everything worked perfectly after this mod. This worked beautifully, didn’t know this was possible before! Thanks so much!! fantastic, soooo simple, theres so much duff information on the web its a joy to come across something really useful that works, THANKS!!! thank you so much ! works fine ! Thank you very much Sir. Your solution helped to fix the problem, I struggled two days searching all around in google, microsoft and other forums. Excellent! Works like a champ! I’ve spent SO much time trying to figure this out. Shame on Microsoft for not making this easier. They don’t get it. Thank you SO much for your information on this. 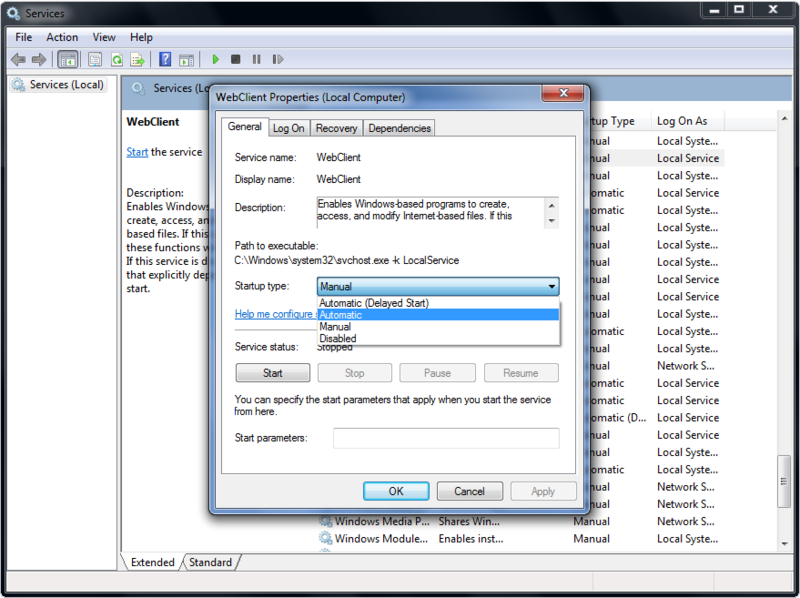 No restart required, simply restart the WebClient service. Your instructions work on Windows 8, too. Microsoft is doing all it can to lock people out that are trying to link to none microsoft machines or those machines that are not running the latest windows version. Webdav has a clear set of rule but microsoft adds it own twist and turns to these rule so it becomes impossible for a developer like me to create my own webdav server on windows but instead are forced to try and use the ones that come with the machine. The server I wrote and list files,download files delete file but when it comes uploading files Microsoft-WebDAV-MiniRedir does a put and then goes to sleep without sending the data because it knows it is 3rd party software and microsoft don’t like that. Code that has worked for years is now broken and I for one am getting tired of playing this silly game with microsoft where you need version 8.3.66.7 with patch KB998080 and then you need to know what registry key to go and hack and if you need a re-boot afterwards. I am following the same steps. But after adding the url it is asking for username and password.I enter my alfresco admin username and password but not able to connect. Thanks! 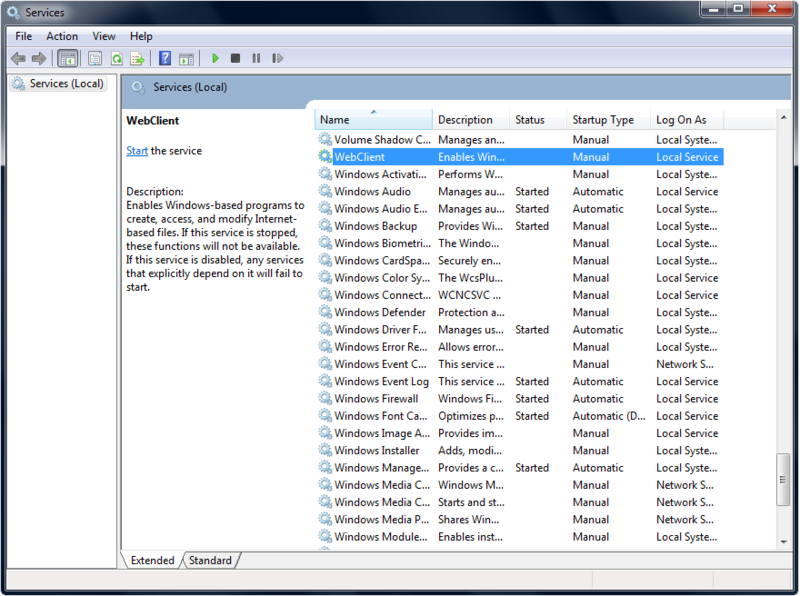 At last I got my WebDAV drive mapping to work on Windows 7!!! Please help, i follow steps above. and it works. but i can’t edit my document, error to save after edit. Worked great for me too! Great Tutorial. Still works with Windows 10. Now only have to find a way to get windows to remember your Webdav credentials. Thanks. You are a GOD. Thank you!! Just needed to edit the SSL bit and it works perfect! Thanks!! Is there anything else that needs tweaking to allow for secure connections?